From Morocco this absolutely wonderful shrub is quite hardy, silky grey silver large leaves are the backdrop in July for show-stopping stems of pineapple scented bright yellow flowers in large cone shaped clusters. A well named form of this well known and exotic looking shrub. Raised by the famous Hillier nurseries back in the 1970's Extra long golden yellow flowering racemes along with the delicious scent of pineapple. Lovely when in full flower the cascading branches laden with large golden yellow flowers flushed attractively with cream. Broom" This red flowered, scented shrub will be smothered in red flowers in April and May. Plant in full sun or partial shade for best results. Height 2m, 3ft. Water until established. This medium shrub (2.5m in 20 years) will delight with its red and yellow flowers in April, and incredible sweet smell. Prefers full sun and free draining soil, but will tolerate partial shade. Water until established. 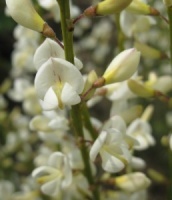 Commonly known as the Warminster Broom, in early May a riot of rich cream flowers. A well known and deservedly popular late spring early summer flowering garden shrub when fully laden with showy white flowers.